We’re often told that you should never eat something if you don’t recognize all the words on the ingredients list. But since most of us have no idea what xanthan gum and potassium benzoate are—let alone what they’re doing to our bodies — we’re decoding the ingredients in the many things Americans put in (and on) themselves with the help of an expert. 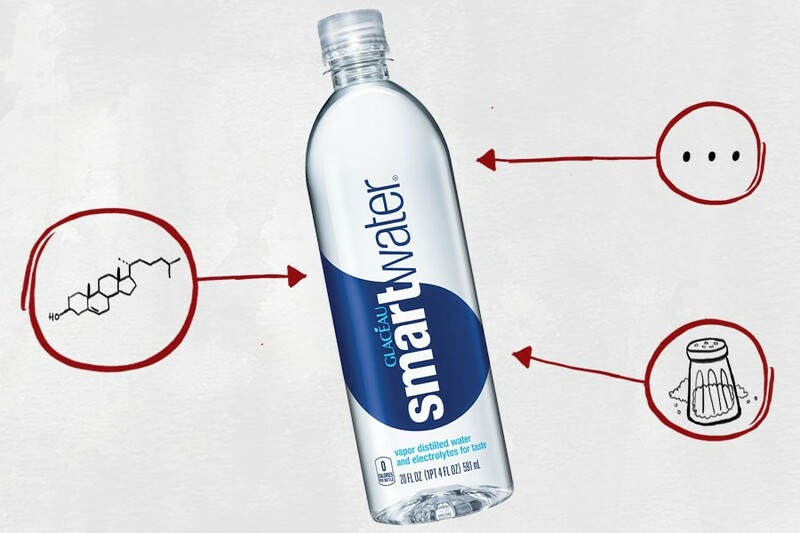 This edition: SmartWater, which, weirdly, is made from five separate ingredients that we’ve broken down in the exact order they appear on their website. 1) Vapor Distilled Water: First things first: “Most facilities that purify and bottle SmartWater procure water from municipal water [aka tap water] systems,” according to the Environmental Working Group. This water is already supposed to be safe to drink straight from the tap since it’s regulated under the Safe Drinking Water Act. 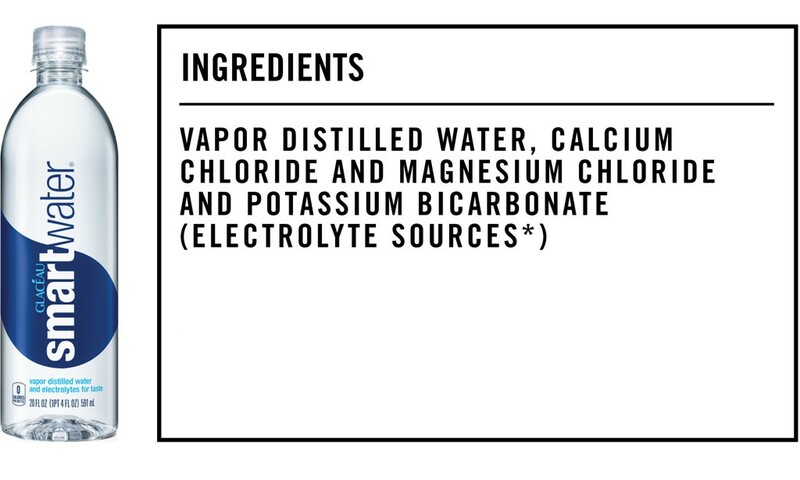 Still, SmartWater sends it through a vapor distillation process to remove minerals and impurities (and, y’know, to put their own stamp on it so you don’t feel like you just paid five bucks for tap water). It’s heated, converted to steam, then collected. This might sound like a good thing — tap water in some areas of the country is laden with contaminants — but it’s not necessarily great. The World Health Organization found that, because vapor distilled water is completely mineral-free, it leaches electrolytes and essential minerals from the body when you ingest it. While this won’t impact those who occasionally drink vapor distilled water, those who only drink the stuff are at an increased risk of developing a litany of ailments related to mineral loss — e.g., osteoporosis, osteoarthritis, hypothyroidism, hypertension, coronary artery disease and premature aging. 2) Calcium Chloride: Calcium chloride is similar to table salt, but it contains calcium instead of sodium, meaning you’ll get the good stuff (calcium) without overloading on sodium. It’s added to reinforce SmartWater with electrolytes and minerals, since the originals were removed during the distillation process. 3) Magnesium Chloride: Magnesium chloride is (surprise!) a source of both magnesium and chloride, which are electrolytes and essential nutrients. Again, these minerals are being added back into the water after being removed during distillation. This is a good thing. Nutritionist Carolyn Dean, author of The Magnesium Miracle, explains that a magnesium deficiency (which can be caused by drinking vapor distilled water that hasn’t been reinforced) can induce everything from irritability and anxiety to seizures and coronary spasms. 4) Potassium Bicarbonate: Potassium bicarbonate is a colorless, odorless, salty substance. It adds a mineral-like taste to bottled water — straight-up distilled water tastes oddly flat, since we’re used to small quantities of minerals in even the purest water, and this makes it taste more, for want of a better word, like “normal” water. It’s generally recognized as safe by the FDA. 5) Electrolyte Sources: Electrolytes are naturally-occurring minerals, like sodium, potassium, calcium and magnesium. Once again, these are being added back into the water after being removed during the distillation process. None of this should be cause for health concerns, says Marion Nestle, professor of Nutrition, Food Studies, and Public Health and professor of Sociology at New York University. The additives being put into water are those naturally found in water and the quantities of these additives are likely too small to be of much significance. However, spending your hard-earned money on SmartWater isn’t smart at all: In most cases, it’s just tap water that’s been filtered, then fortified with mostly the same things that were filtered out in the first place. The smarter choice would be to stick to tap water — with some obvious, horrific exceptions — instead.